HDFC Top 200, Equity Funds – Review + What Next ? This the Largest Equity Fund in India which has grown organically over 15 years and has Assets Under Management around Rs 11,000 Cr. In the last 10 years / 5 years period, the fund has consistently beaten benchmarks. However, returns in a longer duration i.e since inception has tapered off from 28.33% in March-2010 to just 23.49% in Sept-2012 as shown below. Another Top Fund directly under management of Sr. Fund Manager Prashant Jain has enviable corpus of ~Rs9,000 Cr. 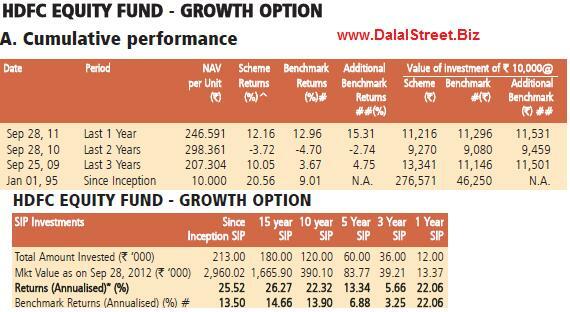 This fund has given extraordinary returns of 30.09% until March-2010. Long Term Returns since inception has tapered off to just 25.5% at the end of Sept-2012. Has beaten all its benchmark indices as shown below. So what do we do next ? Those who started investing early, have already reaped the benefits. Looking at the latest portfolio the fund manager is left with no choice with the burgeoning size of funds but to stick to Large Cap Stocks. Also they are no more as aggressive as they used to be in spotting multibagger or a turnaround story. Returns given over long term, 15+ years has tapered off with the lull in the Market. At one end Fund manager easily beat the benchmark, but has been unable to maintain the 30% returns momentum during sideways phase. So what do we do from here on ? Well, we’re holding what has been invested so far and have reduced the monthly SIP outgo by 50% in Equity and Top 200 Funds. 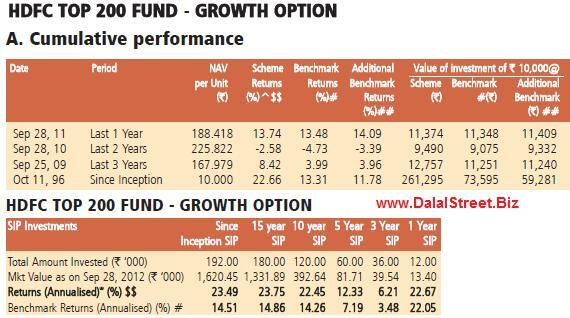 Have increased the exposure to HDFC MidCap Opportunities Fund [will be reviewed separately] as we are still Risk Takers. What Returns to Expect ? Since last year we have reduced Total Equity Exposure from ~95% to 80% [20% in Debt] as we are skeptical of the Corrupt Congress party at the helm of affairs and rising opposition from Citizen Activists towards flawed Government Policies. In the next 10 years, we’d be happy if we get 20%+ compounded returns.